Home > Articles > Trend: The Future of Packaging & Retail: I’m Featured in Frame, the Leading Global Design Magazine! 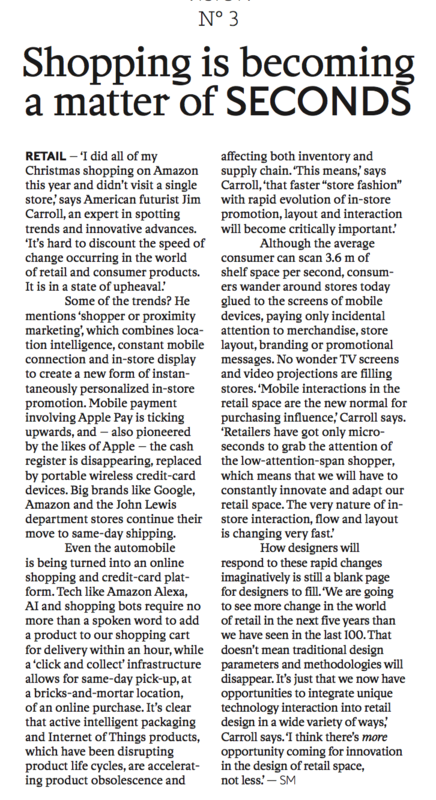 The article offers up all the thoughts I have on the future of packaging in the world of retail – hyperconnected, aware, interactive, and a world in which the package is the brand. I’ve been speaking and writing about the future of packaging for almost 20 years — take a look at some of the posts in this link here. I’m working on getting the text and will link to it, but for now, here’s the article in image form. Click to make it bigger! Some of the trends? He mentions ‘shopper or proximity marketing’, which combines location intelligence, constant mobile connection and in-store display to create a new form of instantaneously personalized in-store promotion. Mobile payment involving Apple Pay is ticking upwards, and – also pioneered by the likes of Apple – the cash register is disappearing, replaced by portable wireless credit-card devices. >Big brands like Google, Amazon and the John Lewis department stores continue their move to same-day shipping. Even the automobile is being turned into an online shopping and credit-card platform. Tech like Amazon Alexa, AI and shopping bots require no more than a spoken word to add a product to our shopping cart for delivery within an hour, while a ‘click and collect’ infrastructure allows for same-day pick-up, at a bricks-and-mortar location, of an online purchase.